Episode 435: Inside SHARK TANK, with Stephen Woessner. Good Morning Onward Nation…I’m Stephen Woessner and welcome to this week’s solocast…Episode 435. Where we are going deep — deep — deep — behind the scenes of one of today’s top reality TV shows. In fact, the Emmy-award winning SHARK TANK on ABC has become the most successful business reality TV show of all time. 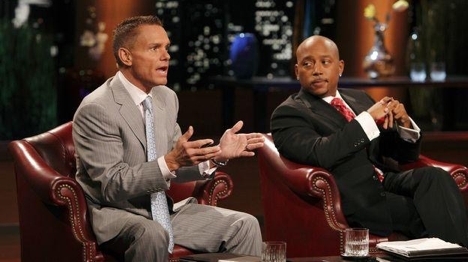 And it because of our incredible guest, Kevin Harrington, that we received a backstage pass to SHARK TANK – including Kevin’s lessons learned – and how – if we apply what he shared during Episode 410 – you too can be a shark. He is exceptional, Onward Nation. So during today’s solocast — I am going to distill down all we learned from directly Kevin into five lessons that you can immediately put into practice within your business. No matter if you want to increase revenue by 10 percent this year – or – you are the path to building a $100 million company as Kevin has twenty times with his companies – there is something here for you in this solocast. I am going to start us off with a sharing some of the highlights from Kevin’s career as an entrepreneur, and then we will dive into the six lessons. Kevin has been a successful entrepreneur over the last 40 years – he is the exact opposite of an overnight success – he started working when he was just 11 years old. I will come back to that story in a minute. 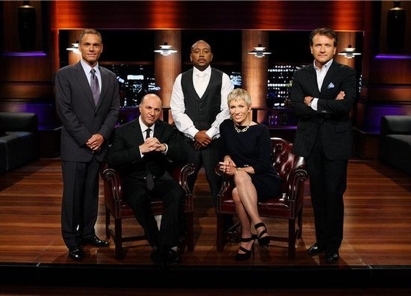 As I mentioned earlier – Kevin is an original shark from Shark Tank. He is also the inventor of the infomercial and “As Seen On TV” pioneer – and the story behind the brilliance of that invention — tie into lesson two this morning. Kevin is also a co-founder of the Entrepreneur’s Organization and has launched over 20 businesses that have grown to over a hundred million dollars in sales each — and has been involved in more than a dozen public companies — launched over 500 products, generated more than $5 billion dollars in sales worldwide with iconic brands such as Jack Lalanne, Tony Little, George Foreman, and the new I-Grow Hair Restoration product on QVC. And it is because of this track record – Mark Burnett handpicked Kevin to become Shark where he filmed over 175 segments. In looking back on what I learned from Kevin during our time together – I can confidently say that these words have served like a creed guiding his life…and it started at a young age for Kevin. Kevin started his entrepreneurial journey working as an 11-year old dishwasher inside his father’s restaurant. At 11…Kevin learned lessons of grit, tenacity, and persistence that he still carries with him today. Kevin’s dad had been an entrepreneur his entire life and wanted his son to follow in his footsteps — but Kevin’s mom — wanted him to become a doctor or lawyer because her father had enjoyed a successful career in banking. Kevin’s mom grew up in a household where the corporate life was the norm – the predictability felt comfortable. But, Onward Nation…entrepreneurship requires swimming against the norm — swimming upstream — it requires us to swim against the rapids — against the odds — and to confidently swim toward the white water, and doing so, we need to have great anticipation for the unknown…the challenge of it all. And sharing his personal story is how Kevin taught me the first lesson of what it takes to be a SHARK. Lesson #1: SHARKS seek out the challenge. When someone tells a SHARK that it can’t be done…or that there is an easier, less trampled path…the SHARK sets out to map his or her own course. Kevin, Onward Nation, is quite comfortable in swimming in the deepest of water…finding the blue ocean…and swimming all by himself if he needs to. Kevin doesn’t need the approval of his peer group. He is not looking for validation. He is a SHARK and knows it. A SHARK, like Kevin, never gets confused thinking they are something they are not. They don’t forget their gifts and talents…or…try to become something they are not. They are acutely aware of who they are and they revel in it for all of their competitors to see. And because of Kevin’s self-awareness…he knew at avery early age that entrepreneurship — and the uncertainty — the challenge of it all suited him perfectly. He learned the ups and downs of running a business working alongside his dad. Kevin’s father was his first mentor — someone who gave Kevin the right challenges to conquer at the right time. To push his son — to show him what needed to be learned — what needed to be mastered — and how to be successful so that when it was time for Kevin to swim out into the deep blue ocean to see his own challenges…he was ready. Kevin used the story of his next adventure in life to teach me the second lesson of what it takes to be a SHARK. Lesson #2: SHARKS seek out opportunity. By the time Kevin was ready to own a car, and then later to attend college, there wasn’t enough money to go around. His two older sisters and brother had already gone off to college and the family budget was stretched. Kevin realized that if he was going to have a car and to attend college — he was going to have to pay his own way. So what does a SHARK do, Onward Nation? He searched the waters for opportunity. He needed to find an opportunity that would help him fund the next step in his journey. To buy his car…Kevin started a driveway sealing business. Not easy work…but the grit, the tenacity, the persistence he was learning was becoming part of his DNA…and he accomplished his goal. But…because Kevin grew up in Ohio…his driveway sealing business was seasonal summertime work. So he looked at the market to seek out a new opportunity…something he could do year-round. And that landed him in the heating and air conditioning business because of the steady stream of year-round opportunity. So during his freshman year in college, Kevin started an HVAC company and it was a success. As a freshman…he had 25 employees and was generating $1 million dollars a year in revenue. And just for context, Onward Nation — that was back in the 1970s, which would equal $6.2 million in today’s dollars. All the while…Kevin was a college student. Super impressive! After college…it was Kevin’s ability to seek out opportunity that fueled the acceleration of his career to become one of today’s top business owners. When Kevin was in the heating and air conditioning business — he would travel around the country to different trade shows looking to learn and to seek out the next opportunity. He would go to home shows and heating and air conditioning shows — and it was at one of the home shows that the inspiration for his next opportunity hit him. So then Kevin told me the full story behind his invention of the infomercial. He watching one of the exhibitors at a show sell a knife set and was impressed with the demonstration and the entrepreneur’s ability to sell the small audience watching the demo on the benefits of the knife set. But, the entrepreneur was only pitching 10 people at a time…and yes…eight people out of the 10 would want to buy at the end of the demo…but it was still only 8 sales. That compelling demo flashed Kevin back to his recent experience as a brand new cable subscriber. He had asked the cable company to give him all the channels they could – the biggest package available – which was 30 channels back in the early 80s. He got a 24-hour news channel, CNN, a 24-hour movie channel, HBO, 24 hours a day of sports, ESPN. Rock solid awesome. But, when he turned on the TV late one night…for what he thought would be 24-hours of national geographic shows…it wasn’t there…all he saw were color bars. That’s when the lightbulb went off for Kevin. He asked the representative at the cable company if he could come down and talk to somebody about putting something on the network during the dark time that they could both make money at. So let’s go back to the home show…Kevin watching the knife demo – cutting through a Coca-Cola can – a powerful visual demonstration. The knife set was called the “Ginsu” and Kevin knew it would be perfect for TV – and could fill the empty inventory that the cable company clearly had. Onward Nation…Kevin started locally in Cincinnati, Ohio and bought up the excess programming inventory. And then when they had proof of concept…Kevin went to Discovery Channel at the network level and said, “Hey, I’ll program six hours a day for you”, which turned into a long-term contract and that led to a deal with the Lifetime network. Onward Nation, Kevin’s imagination and his pursuit of opportunity gave birth to the infomercial at a time when the market was ripe for disruption. Kevin went on to work with Jack Lalanne, Tony Little, Billy Mays, and even George Foreman with his popular Foreman Grills. And all of this was years before QVC ever started. But a very key piece in this lesson, Onward Nation, is that Kevin realized there were significant opportunities on the front-end and back-end of the infomercial business. For example, he signed contracts with inventors of products and pitchmen to create the right TV presence, the right story, the right direct response marketing to consumers…but…Kevin also realized there was money to be made on the back-end…in the customer service…in the manufacture and distribution of all the goods, too. So when Kevin approached a business owner with an opportunity to join his portfolio of products…he was providing an A to Z solution that was very compelling and provided built-in marketing and distribution. And then it went viral, Onward Nation, before “viral” was even a thing. Kevin shared with me how one opportunity built on and led to the next. They took it viral not only in the US then went to England with Rupert Murdoch…then to Italy…then into Spain…into Germany…to Sweden, Latin America, and Japan. Their distribution went worldwide viral through the TV networks with an 800 number on the back of it. Kevin’s system generated hundreds and millions of dollars over several years. And they were able to do that because Kevin and his team were not just creating content for stations – they also manufactured the products, imported the products, created a phone center to accept orders, set up a fulfillment center to ship the goods, a bank to cash the credit cards, a customer service center to handle the customer service. Kevin capitalized on the opportunity to create a complete front and back end marketing and distribution machine. He was the pioneer behind the catchphrase – “not available in stores.” And that ensure that all of the dollars for their products flowed through their own front and back end system. Direct to consumer. Brilliant. Kevin was able to tie up the rights to all of them with all of their ideas, all their products. Kevin and his team created an industry but it started with seeking out an opportunity and then not being afraid of the enormous challenge that it represented. Lessons #1 and #2, Onward Nation. And Kevin still applies this same level of curiosity today by attending 25 to 30 trade shows a year. I interviewed him just days before he left for CES in Las Vegas. He speaks at the events…meets with business owners in his portfolio of companies…and then is always on the lookout to be pitched the next opportunity. Let’s move to Lesson #3, Onward Nation: SHARKS are relentless. 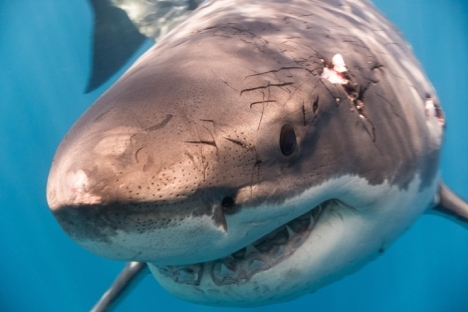 SHARKS never stop swimming toward their goal — because if they do — they will suffocate and die. And that makes a SHARK relentless. They have a strong will to win. But their will to win isn’t because they just want to survive – no – a SHARK is driven to thrive. Even if that means they will collect battle scars along the way…each scar is just additional experience. A SHARK’s relentless pursuit to thrive is what has made them the undisputed top of the oceanic food chain. A Great White shark will nearly eat anything. And if a competitive feeding frenzy ensues – the SHARK with the strongest, most unrelenting will is the one who gets the most meat. It is their relentless nature…their relentless pursuit of an opportunity…that produces incredible success. And yet…he relentlessly did it anyway. Because that is what SHARKS do, Onward Nation. Time for Lesson #4: SHARKS never stop learning. And because SHARKS never stop learning — they are excellent problem solvers — and they pivot when necessary, and consequently, are on the front-end of the disruption. SHARKS are early adopters to new tech so they can continue their position of market leadership and being at the top of the food chain. But they also help set the new trends and can be excellent teachers if we are willing to watch and learn. For example, when Kevin attends a trade show…it is often in the role of being the keynote speaker. And he is there to share content about the disruptions he is seeing in the marketplace – where is the market headed. He can share those types of insights because he never stops learning – he doesn’t rest on his laurels – his relentless nature of being a SHARK demands that he continue to learn – to continually perfect his craft in order to be the best expert he can be. And his thought leadership is highly sought after because the “As Seen On TV” industry is in the midst of a serious disruption. For example, I learned from Kevin that there are 50 percent fewer viewers on TV today than there were 10-years ago. When shows launch today – if it’s good – it will receive 5 to 6 million viewers – and maybe 7 to 8 million viewers if it is really good. And if you go back just 10 years, those same shows would be doing double that. But, today’s audience is gone. They are either on YouTube, Hulu, Netflix, Amazon Prime, or getting their content on their iPads, iPhones, etc. Kevin described it as “cord cutting” and it is taking place at a very rapid rate right now. And because of that…industry associations are turning to Kevin – who built such incredible success around TV with his empire of products and back-end fulfillment systems – to now teach what is next. And because Kevin saw the trends coming – because of his study and learning – he smartly pivoted. As a result…he is profiting within completely different platforms because he has learned what the consumer wants – and – where they want it. Kevin urges today’s business owners to “Follow the eyeballs. They’re on Facebook. They’re on Pinterest. They’re on Instagram. Which is why 80 percent of Kevin’s business comes from digital channels versus 100 percent coming from his TV presence just 5-years ago. Onward Nation, when was the last time you watched Shark Week on the Discovery Channel and you saw a shark being indecisive? Did you see it hesitate? Did you see it circling around an opportunity and never taking action to either strike or move on? Living in fear and not knowing if they should move in to investigate and then decide if they should eat it or not doesn’t happen in the wild. Because sharks in the wild are decisive. And SHARKS in business share that same trait with their oceanic counterparts. How often have you seen Kevin and his fellow SHARK investors inside the Shark Tank waffle around a deal? Never. It doesn’t happen. Within minutes, they decide if they will — or won’t invest — in someone’s dream. They don’t belabor a point…they are either in or they are out. They are decisive about an opportunity. When they see an opportunity…they move. I have been a fan of SHARK TANK for a long time – so during our pre-interview chat – I asked Kevin if he would be willing to take us behind the scenes of SHARK TANK. I was delighted when he agreed. So here we go, Onward Nation…way…way…way…behind the scenes. It is as if Kevin gave us an all access studio pass. Here are some of the highlights. Shark Tank is filmed on a soundstage on the Sony movie lot in Culver City, California – just outside Los Angeles — where all the original big movies with Clark Gable and today’s biggest Hollywood blockbusters are filmed. Gulp. And during the shooting of the first several episodes, the Shark Tank soundstage was physically right next door to the soundstage where Robert Downey Jr. was filming the first Iron Man movie. Onward Nation…nobody knew what Shark Tank was at that point. It was brand new. I am so glad Kevin shared that insight – because – it illustrates so perfectly that even one of the biggest shows on TV – had to start somewhere and that somewhere was at the bottom. The ceilings within the soundstage were 60-foot high with 16 cameras and a crew of 150 people bustling about! Now, Kevin came from a television business – he shot many infomercials and being in front of a camera was easy for him. But, a big expensive shoot in Kevin’s world before Shark Tank was five cameras – and now he was on the Sony movie lot inside a soundstage that cost $1 million to build with 16 cameras and a 150 person crew. There’s the challenge Kevin spoke about, Onward Nation. This was Hollywood. This was ABC, Sony, and big time Mark Burnett. He produces the biggest and the best from Survivor and all that. Because of Mark’s words, Kevin had a peaceful feeling and he could just focused on his expertise and what he did best. But there was also another form of risk to the SHARKS themselves. At that particular time, ABC had not committed to air SHARK TANK. So Mark Burnett still had to negotiate for distribution of the show. So the reality was – that the SHARKS were investing in deals that had no guarantee of distribution on TV. Kevin is one of the original SHARKS who helped forge the show because we went all in – he wrote checks to companies that were coming on SHARK TANK with no guarantee of distribution – no guarantee of getting eyeballs for those investments. So for the SHARKS – it was a very risky proposition. They were investing hundreds of thousands of dollars of their own cash into deals that may never be seen by anybody on TV. The initial episodes were pilots. Fortunately, selling to the networks is a skill for Mark Burnett. He got it sold into ABC, and the show launched in 2009, and the rest is history. But SHARK TANK — as well as Kevin Harrington’s incredible career — are great illustrations of how there is no such thing as an overnight success. Onward Nation…it takes grit, persistence, and tenacity to make your dreams a reality. Don’t give up — keep pushing — don’t ever quit. We will be back tomorrow with an interview with Cameron Herold, the top-rated lecturer at the EO / MIT’s Entrepreneurial Masters Program.